This is one of two villas that are located right next to each other; both have their own entrance and swimming pool and can be rented together or separately. They are so close to the water’s edge that swimming in the pools feels like being in the sea. Three beautiful secluded beaches are conveniently located only minutes away from the villas. 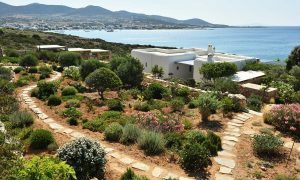 For those who want to experience an authentic seaside atmosphere, the small village of Alyki is only a couple of kilometres away. This villa has a more traditional look. 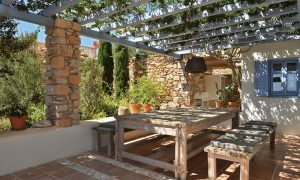 With its cosy living areas and large terrace that offers a great space for outdoor dining, this wonderful villa is the ideal place to enjoy a relaxed holiday by the sea. 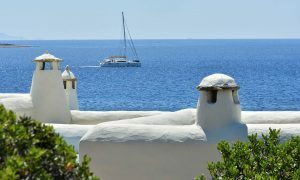 The several comfy sitting areas with amazing views of the sea, sunset and sunrise will allow you to experience the magic of the Greek summer. 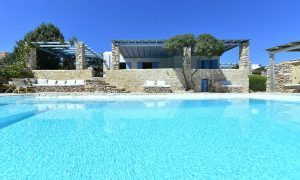 The southern villa is 160m² in size and is located on a 6,600m² piece of land by the sea.